As the party that has won wars, reversed recessions and held prime ministerial power more times than any other, the Conservatives have played an undoubtedly crucial role in the shaping of contemporary British society. And yet, the leaders who have stood at its helm – from Sir Robert Peel to David Cameron, via Benjamin Disraeli, Winston Churchill and Margaret Thatcher – have steered the party vessel with enormously varying degrees of success. With the widening of the franchise, revolutionary changes to social values and the growing ubiquity of the media, the requirements, techniques and goals of Conservative leadership since the party’s nineteenth-century factional breakaway have been forced to evolve almost beyond recognition – and not all its leaders have managed to keep up. This comprehensive and enlightening book considers the attributes and achievements of each leader in the context of their respective time and diplomatic landscape, offering a compelling analytical framework by which they may be judged, detailed personal biographies from some of the country’s foremost political critics, and exclusive interviews with former leaders themselves. 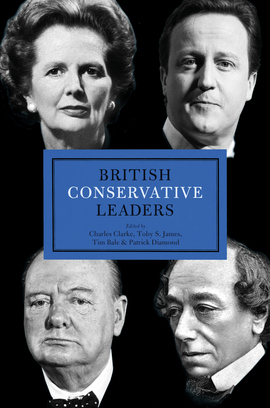 An indispensable contribution to the study of party leadership, British Conservative Leaders is the essential guide to understanding British political history and governance through the prism of those who created it. Contributing authors include Matthew d’Ancona, Tim Bale, Stuart Ball, Jim Buller, John Campbell, John Charmley, Charles Clarke, Mark Davies, Patrick Diamond, David Dutton, Dr Mark Garnett, Richard A. Gaunt, William Hague, Angus Hawkins, Timothy Heppell, Andrew Holt, Michael Howard, Toby S. James, Nigel Keohane, Jo-Anne Nadler, T. G. Otte, Anne Perkins, Robert Saunders, Anthony Seldon, Andrew Taylor, D. R. Thorpe and Alan Wager.